I love doing card challenges, and I was happy to find another challenge blog to submit my work to! 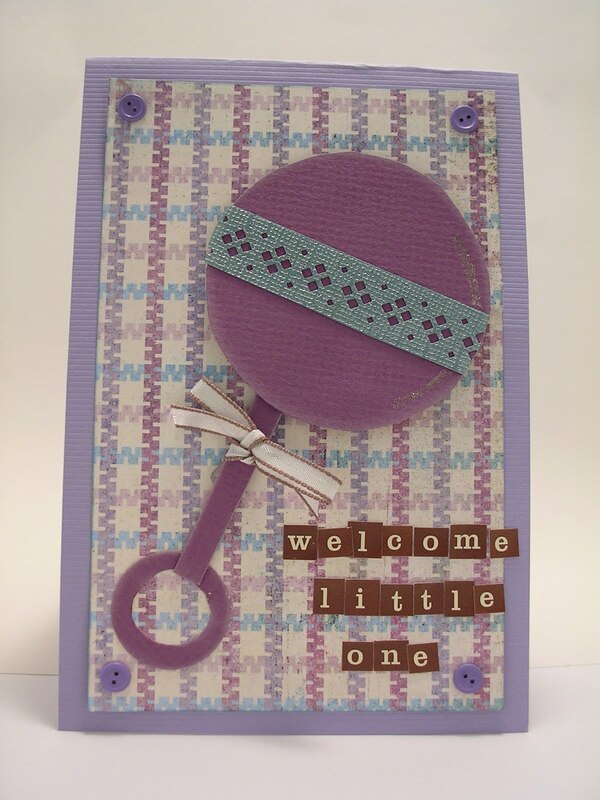 This week’s Caardvarks challenge is to create a baby card. It was a challenge for me, but I’m very pleased with the result. This is also the first picture I’ve taken using my new lightbox, which I made by following a Web tutorial. The patterned paper is from Basic Grey’s Kioshi line. The button brads are from Making Memories and the letter stickers are from Cosmo Cricket. I made the rattle out of cardstock by paper piecing each section. I border punched the blue strip that goes across the middle and tied a piece of Martha Stewart ribbon across the rattle’s handle. Great paper pieced rattle. Thanks for joining us at the Clear & Simple Stamps sponsored Caardvarks challenge. Cute card!! Thanks for joining us at Caardvarks!! This is super cute! Love the rattle, very creative!